When Fillers Aren't Enough: Do You Need Cosmetic Surgery? In our last post, we touted a remarkable procedure, the Dermess Liquid Lift, which can help some patients postpone cosmetic surgery by “lifting” the contours of the face with Botox and wrinkle fillers. But sometimes you need to go for a more definitive procedure. 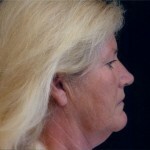 For example, the patient pictured here had too much “extra” skin to benefit from fillers. 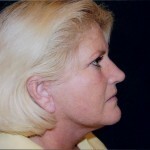 After facelift surgery by Dr. Marvel, her skin appears tighter, firmer and smoother. Cosmetic surgery is not one-size-fits-all. Don’t get caught up in infomercials that promise a quick, low-cost fix. Each patient has special needs and expectations that only professionals can address. At Dermess, we invite you to experience the personal touch that you simply can’t find at a franchised clinic. We will help you define the best course of action, be it surgery or medspa treatments — or both! Our approach to facial rejuvenation is what makes us unique in Nashville. Our mission at Dermess is to help our patients navigate through all the options so they can make the best decision possible. Everyone at Dermess – from our medical aestheticians to our nurses to Dr. Marvel – works together to help you decide what is right for you. As Terri has said for 15 years, we are your “filter” when it comes to discovering your best, most vibrant look. This entry was posted on Friday, December 3rd, 2010 at 3:57 pm	and is filed under Uncategorized. You can follow any responses to this entry through the RSS 2.0 feed. You can leave a response, or trackback from your own site.